Enter any industrial facility or warehouse in the United States, and chances are you’ll see propane forklifts in use. In fact, more than 670,000 propane-powered forklifts are in use in industrial, manufacturing, and construction businesses all over the country. These companies understand that propane offers several distinct advantages over diesel, gasoline, and electric forklifts in the day-to-day operations of their businesses. 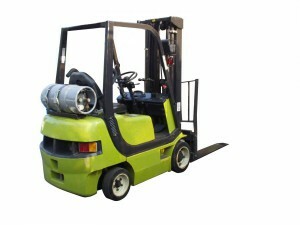 A propane-powered forklift’s fuel cycle allows it to operate for up to eight hours between refueling. Electric-powered forklifts, by contrast, are only able to operate between three and six hours before requiring a recharge. Diesel and gasoline-powered forklifts are at the mercy of their fuel efficiency and tank size. Refueling a propane forklift is a simple matter of replacing the cylinder, which can be done in as little as five minutes. This is particularly important for companies that operate in shifts, as cylinders can be changed out at the end of one shift or the beginning of another, minimizing downtime. Propane is listed as a “green” fuel in the Clean Air Act of 1990, largely due to its clean burning and lower carbon monoxide emissions. Vehicles fueled by propane can be operated within an enclosed area such as a warehouse or factory with lower risk for exposure to carbon monoxide. Gasoline and diesel engines are subject to damaging engine deposits, which affect fuel efficiency and mechanical operation. Propane produces fewer engine deposits, resulting in engines that require less maintenance and run longer without issues. Unlike electric forklifts, propane-powered forklifts maintain consistent power regardless of the task at hand. Whether handling heavy loads or moving materials up and down inclines, propane forklifts provide 100 percent power, consistent speed, and endurance for the job at hand. Many companies choose equipment based upon its versatility in a variety of operations. A propane-powered forklift can be used indoors or outdoors and can provide consistent power and speed for every use. What’s more, the fuel cylinders can be moved or stored virtually anywhere on a job site. As a low-emission, low-combustion fuel, propane can be safely stored and transported, and changing out a fuel cylinder on a forklift is a simple matter. The tanks, fuel lines, and carburetion components of a propane forklift meet or exceed strict specifications, and in the event of an accident, built-in safety devices automatically shut off the flow of fuel. The aspects that make propane a safe fuel source in residential applications also apply to commercial and industrial use. Many businesses across the country rely on propane forklifts to move goods and materials safely, efficiently, and economically within their work site. When compared to gasoline, diesel, and electric forklifts, propane-powered forklifts provide substantial benefits to the companies that use them in their day-to-day operations. A number of heavy equipment manufacturers offer propane forklifts as part of their equipment lines. For a partial listing of these manufacturers, click here.